May these ghosties find their way to your door this dark and spooky night! 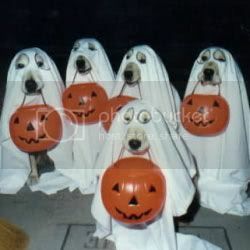 Those are some adorable ghosties. I'd never get mine to do that! Hope your Halloween was filled with spooky adorable pups!